Technology use, mobile in particular, in US restaurants is on the up. Information about a restaurant, viewing menus, reading online reviews, using rewards and special deals, and ordering takeout or delivery are the top usages; this is followed by looking up nutrition information and paying for meals. Customers’ reasons for not using technology included a preference for dealing with people, not knowing how to use the devices, as well as not trusting the tools to work correctly. The National Restaurant Association reports that smartphones account for a large part of regular usage with 70% of restaurant customers regularly using their mobile phones for ordering delivery, redeeming rewards and paying for meals. Younger consumers in particular are most active with 90% of 18-34-year-olds using mobile devices along with 89% of 35-44-year-olds. One-third of consumers are also happy to use a smartphone app to pay their meal instead of using cash or debit/credit card. “While overall usage of restaurant technology options is still more common among diners in the Millennial generation compared with Baby Boomers, the age gap generally levels out when it comes to frequent users,” said Hudson Riehle, Senior Vice President of Research for the National Restaurant Association. 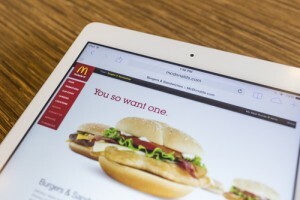 “As restaurants integrate more customer-facing technology, usage among consumers is growing. When done right, it can help a restaurant’s productivity and the customer experience”, he adds. These latest findings are reflected in McDonald’s US move to introduce mobile payments to its in-restaurant and drive-thru locations. Customers can opt to pay for their orders, using an app by Softcard that allows them to tap and pay. The app combines payments, offers and loyalty redemption. In addition, MasterCard is also bringing contactless payments via NFC-enabled devices to ballpark food and beverage concessions at the 2014 World Series. Meanwhile a US Cornell study has also found that restaurant guests are keen to use smartphones and table-top tablets to pay their bills over traditional cash and card payment methods. Kimes, a professor of operations management and a Menschel Distinguished Teaching Fellow at the Cornell School of Hotel Administration commented: “We tested the use of smartphone apps and table-top systems on eight different measures. Technology beat out the traditional settlement method on all eight, including overall guest satisfaction”. The eight measurements included: accuracy, control of pacing, convenience, efficiency, experience quality, future spending intentions, privacy, and satisfaction with the payment method. Despite the rise in mobile payment adoption, payment providers continue to push card payments. MasterCard and Zwipe just recently announced a partnership for the launch of the world’s first contactless payment card featuring an integrated fingerprint sensor. The card is said to offer consumers a fast, convenient payment solution that does not compromise on security. The cardholder fingerprint data is stored directly on the card rather than in an external database and the biometric authentication replaces the PIN entry. As a result cardholders can make payments of any amount free fro the limits of existing contactless payments.